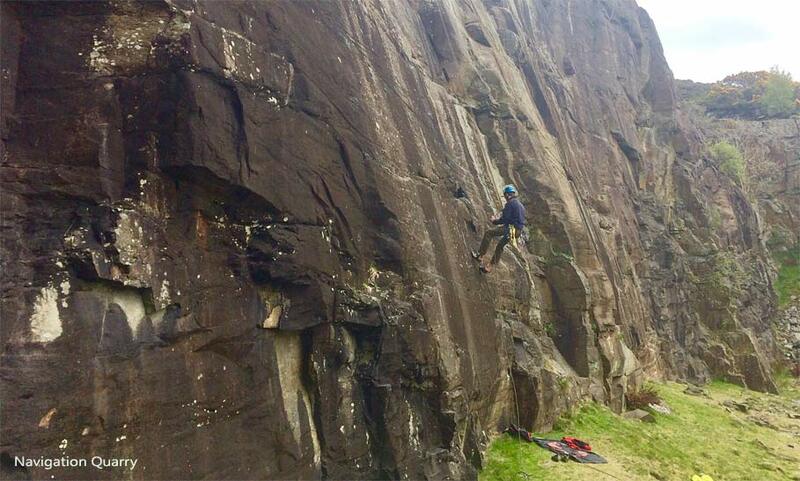 South Wales is now a mecca for rock climbing. With 10 cliffs within a 45 minute drive you can access top sport and trad climbing venues. This includes the limestone cliffs of the Wye valley to the quarries of Gilwern and sea cliffs of the Gower. We don't provide formal guiding ourselves presently but can advise on appropriate venues depending on your abilities. Andy a keen climber with good local knowledge of the crags may able to join you and we can supply guide books . We can also arrange formal rock climbing instruction with qualified local guides by prior arrangement. For novices this is often at Symonds Yat in the upper Wye valley although we have a wide selection of crags depending on individual ability. South Wales Sports Climbs Rockfax 2016 with over 600 routes (www.rockfax.com/climbing-guides/books/south-Wales-sport-climbs) covering the Wye Valley to local limestone quarries close to Dukes Barn and the extensive limestone sea cliffs to the south. (www.climbers-club.co.uk/shop/books/south-west/lower-wye-valley) covering both trad and sports routes . Gower Rock Guidebook 2013 (https://www.pesdapress.com/index-Php/product/gower-rock) covering classic trad sea cliff climbing of the Gower from Falls bay and Three Cliffs to sports crags nearby. The best local indoor climbing walls are The Summit Centre near Merthyr Tydfil (www.rockuk.org), and Cardiff's premier wall BouldersUK (www.bouldersuk.com), in Hereford the newly built wall 'the Send' (http://www.the-send.co.uk) and in the Langorse multi activity centre offers climbing near Brecon (www.activityuk.com/indoor/indoor-climbing). Gilwern Main and Gilwern East: An old limestone quarry on moorland above Abergavenny is just 20 minutes away. Well bolted sports climbing venue and plenty of 5's and 6's. Over 80 short single pitch sport routes. Tirpentwys: A fine south west facing and sheltered sandstone quarried crag close to Pontypool , about 25 minutes away. 30 sports routes in the lower to mid grades. Symonds Yat: A classic trad cliff in the upper Wye valley . 45 minutes drive. Shorn cliff: A limestone trad cliff above the River Wye near Tintern Abbey. A 45 minute drive and 30 minute walk in. Popular trad crag with wide range of grades and routes up to 30 meters long. Wintours Leap: A substantial series of limestone crags , directly above the River Wye , close to Chepstow. Predominately a trad venue with over 200 routes and rising up to 60 meters in height. Woodcroft Quarry: A sports venue adjacent to Wintours Leap. Many new routes. Tintern Quarry: (currently out of bounds) A sports venue on banks of the River Wye , 2 miles upstream of Wintours Leap. A 45 minute drive and 10 minute walk. Wyndcliff: Two limestone cliffs with a sunny southerly aspect , in the Wye valley north of Chepstow. Trad climbing with plenty of low and mid grade climbs. A 50 minute drive and 10 minute walk. Wyndcliff quarry: Two limestone tiers with over 150 sports routes . Superb sports climbing venue , quick drying and much recent development. 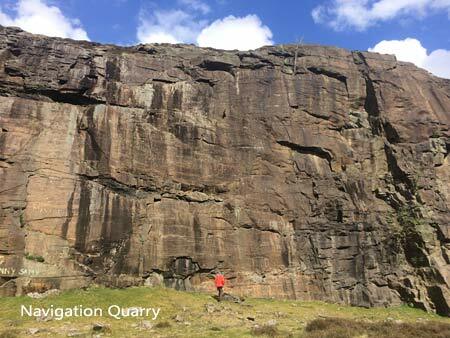 Navigation Quarry: A sheltered south facing sandstone quarry with about 25 sports climbs in the mid grades from 6a to 7a. Good edge climbing on compact steep slabby routes and very popular with the Cardiff climbing club. Close to Merthyr Tydfill. Three Cliffs Bay: Classic trad slab sea cliff climbing on the Gower peninsula in Oxwich bay. Mainly lower grades and very popular. About 1.5 hours drive. Gower peninsula sports climbing: 12 different coastal sports venues to choose from. With Rams Tor in the east ( close to Swansea) to Rhossili Beach to the west . Rhossili Beach is one of the major sport climbing destinations in South Wales, having a wide range of superb and challenging lines across the grades. Climbing directly from the beach so check the tides, bring a clip stick and protect your gear from the sand! Where can I find guidebooks? How far away is the climbing? Can you accommodate novice rock climbers keen to try / learn? What would you recommend for sport climbing locations? Where can I climb trad? What about rock climbing in the winter months? What climbing equipment do I need to bring? Where can I buy climbing gear locally? How easy is it to reach crags without a car? Links to the most popular guidebooks are flagged above. The closest crag is sports climbing at Gilwern , above Abergavenny and the Usk valley a 20 minute drive away. However there are over a dozen trad and sports cliffs within an hours drive from the barn. Can you accommodate novice rock climbers keen to try/learn?? Yes, we can arrange instruction with a qualified climbing instructor at one of the local crags and you can use the indoor climbing wall at the barn with some help from us. There is so much choice it's difficult to single out one venue. Much depends on your grade of climbing and selecting a crag suited to the weather. Again , lots of choice ,especially in the upper and lower Wye valley. The Wye valley crags offer sheltered sea level climbing and some dry quickly after rain . We particularly favour Wyncliffe quarry with its sheltered southerly aspect and is often busy over the the winter months. And the indoor climbing walls in Cardiff, Hereford and Langorse centre are good options. Check out the South Wales sports climbs guidebook for the best bouldering options. You will need to bring your own equipment. 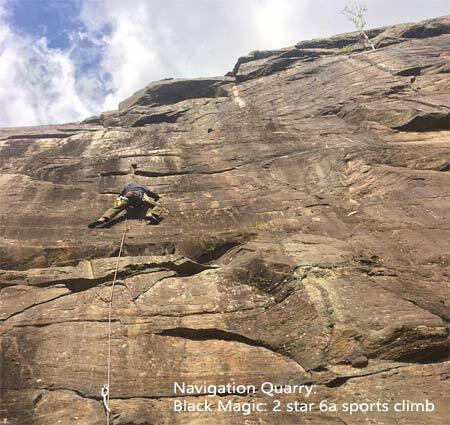 For sports climbing normally a 40 meter rope is sufficient on most single pitch sports crags and 15 quick draws and a 60 metre rope is needed for the longer sports routes. Plus helmet , harness, belay device, chalk and rock shoes. Andy has his personal climbing equipment which can be used if you are climbing with him . For trad a full rack and 50 meter double ropes etc. If you are a novice or booked with a qualified climbing instructor then all technical equipment will be provided. Just bring outdoor clothes. Whilst Crickhowell and Brecon have outdoor shops for technical gear the Boulders climbing wall at Cardiff has a good selection. A car is needed to reach the crags. So ideally bring your own car or rely on local taxis.